"The best recipe by far we have ever made for Thanksgiving. The glaze makes the turkey sweet and succulent!" Combine sage, salt, and thyme in a small bowl. Rub half of the sage mixture all over the turkey, then place the turkey in a large roasting pan. Set remaining sage mixture aside. Bring butter, orange juice, orange marmalade, honey, and orange sections to a boil in a saucepan over medium-high heat. Reduce heat and simmer uncovered until thickened, stirring occasionally, 15 to 20 minutes. Stir in the remaining sage mixture. Brush the turkey with the glaze. Bake the turkey in the preheated oven for 5 hours and 30 minutes, basting every 30 minutes. Cover turkey lightly with foil and continue baking until no longer pink at the bone and the juices run clear, 30 minutes to 1 hour, occasionally brushing with the glaze. An instant-read thermometer inserted into the thickest part of the thigh, near the bone should read 180 degrees F (82 degrees C). Remove the turkey from the oven, cover with a doubled sheet of aluminum foil, and allow to rest in a warm area 10 to 15 minutes before slicing. 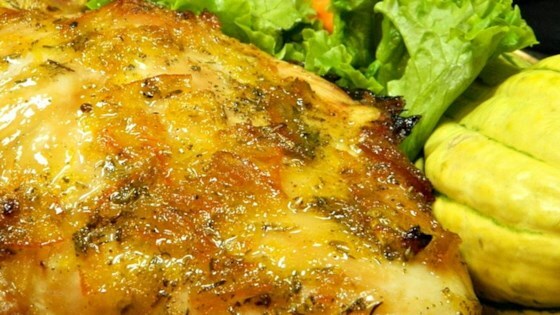 Citrus flavor adds zest to roasted chicken! I made this for Thanksgiving and my adult sons who always insist that we also have ham cause they don't like turkey loved it. I used this recipe for our Christmas Turkey yesterday. It did not disappoint! Wonderful flavors, sealed in moisture, beautiful color bird! It was a great hit. The recipe's a keeper! Thank you. I use this glaze for any bird that goes in the oven! LOve it! If I don't have marmalade I substitute orange soda or bar b que sauce. Very taste and we will make it again next year. Used this glaze over grilled pork tenderloin. Excellent!